High quality, up-to-date information on proper diet, especially strong detail on good fats and Omega 3, and their importance to healthy living. Note that this book doesn't really get into other healthy living topics such as exercise, sleep and stress management. An outstanding memoir from a true warrior. Goggins goes deep into the mindset of someone who accomplishes extremely difficult physical feats. Highly recommended, especially for young men. The bonus back and forth between Goggins and the narrator between chapters is a real treat and also insightful. 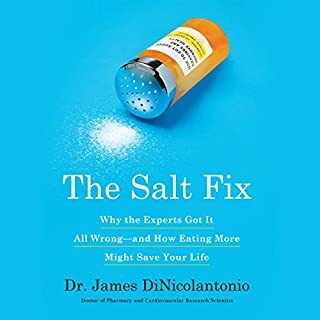 So many great bits of knowledge and practical advice on every single aspect of how to best incorporate salt in our diets. This book dispels so much bad advice that has been foisted on an unsuspecting public over the past few decades, with such tragic results. 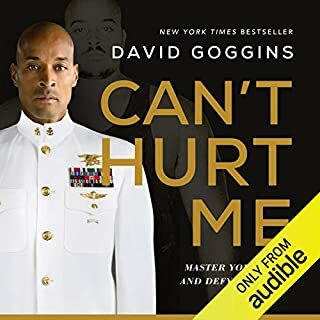 This is a one of a kind book and I would sincerely say of critical importance to people dealing with illnesses and vague lethargy, and athletes seeking superior performance. Very highly recommended. It's already noticeably improved my life in a few short days. 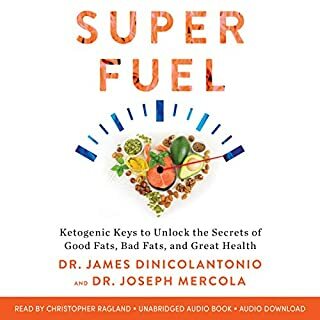 Anyone grappling with adult onset diabetes should listen immediately to the audiobook, which shows the way to reclaiming your health through better diet. 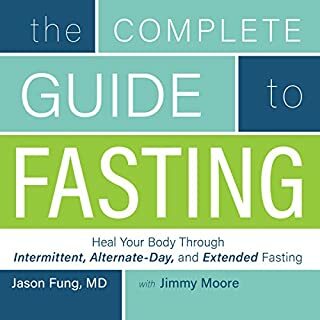 This book is about much more than fasting, but in an entertaining way goes into every kind of detail about fasting that you could think of. This information isn't really available all in one place like this anywhere else. This cutting edge stuff, and personally life-changing. Get this book!! 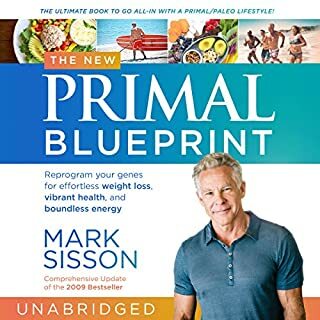 Covers all the bases of the Diet-Evolution, ketogenic, paleo, intermittent-fasting revolution that is dramatically improving the lives of so many North Americans burnt out and overweight from way too much sugar and grains, and improper exercise and lifestyle choices. This revised version cleans up the odd loose ends​ from the first edition, and the narrator is like a buddy chatting with you at the gym. Highly recommended for anyone looking to take back control over their health and fitness. I myself have adopted many of these measures and lost 35 lbs. and regained robust health in 9 months. 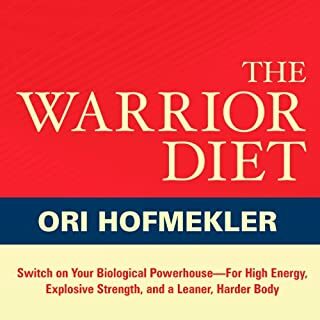 Twenty years ago Ori was more or less the first person to popularize what today is called intermittent fasting, or what he called at the time "undereating" during the daytime before "feasting" in the evening. Since then he and others have refined the concept and related health ideas quite a bit (today in 2018 he's far less keen on meat, for example), but if you're a student of the history of IF and the ketogenic diet, this book is essential reading/listening about this extremely beneficial health movement of the 21st century. 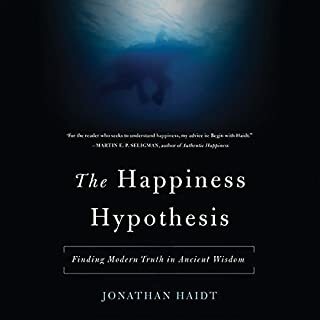 The narrator does an excellent job, with writing that can get a little bombastic at times (think Nietzsche writing a diet and exercise book...) but it's all good fun, with lots of anecdotal stories and observations, as a lot of the scientific studies on IF hadn't been carried out yet when the book was written. Subtly brilliant. Life changing! 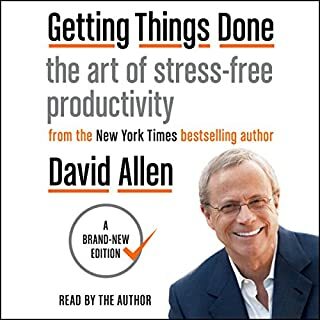 It's very interesting how he speaks in broad principles for hours on end, and as a listener, you fill in the specifics of your own planning challenges, and the end result is you come up with all sorts of solutions to your problems. Highly recommended!! Brilliantly sets the frame for how to look at living a healthy life over a longer lifespan. The narrator is superb and empathetic. 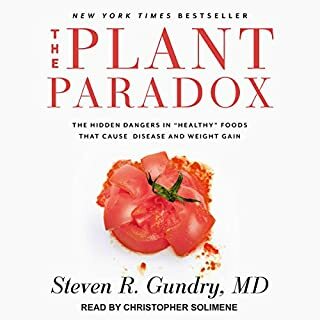 Dr Gundry's more up-to-date thoughts are in Plant Paradox, which is a more technical book, so this is the better one to start with, even if it's a decade old. I followed Dr Gundry's advice and have lost 28 pounds (all fat) over the past five months and feel fantastic. A life changing book -- strongly recommended!! The narrator is little nerdy to listen to, but the content here is outstanding. Following Dr Gundry's many brilliant insights and tips from all three of his books, I've lost 30 lb. (all fat) over the last 5 months and feel fantastic. 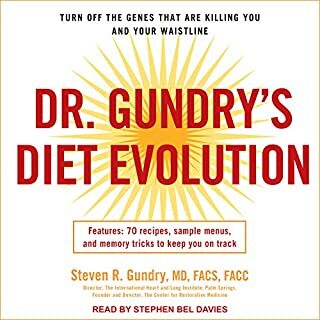 His Diet Evolution book is best and more approachable if you're entirely new to Dr Gundry, but this has much more scientific detail and reflects his latest thinking. There's so much contradictory advice out there on the market and in the media, but this is the real deal. I can't recommend this book enough!! !